It’s not necessarily a ringing endorsement when a picture is lauded Best and Most Wholesome Of Its Kind, but that was about the only way a 1960 audience would accept any biographical treatment of Franklin Roosevelt, such was his God-like status among ticket-buyers. 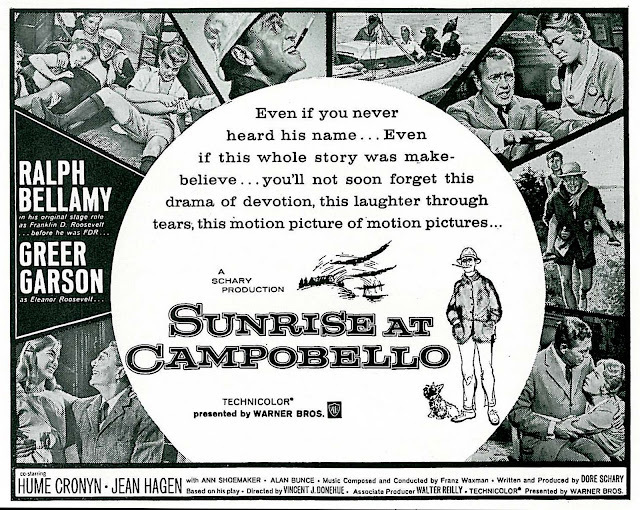 Sunrise At Campobello became compulsory viewing for me one night at age thirteen when Greensboro’s Channel 2 ran a syndicated print in prime time. You really need to watch this, my mother said, parental encouragement to engage any movie being sufficiently rare as to pique my curiosity. The comforting familiarity of Ralph Bellamy, he of The Wolf Man and Ghost Of Frankenstein, saw me through 144 minutes chopped down to who knows what by Channel 2’s besieged editors, bound as they were to jam Sunrise At Campobello into a two-hour time slot with commercials (weren’t they the ones, after all, that removed Psycho’s shower scene, in toto, a few years later?). I knew at the time I was watching something more to be admired than enjoyed. Would effect still be the same upon revisiting SAC on Warner’s Archive Collection DVD? It was. Being complete (ouch) and uninterrupted (took four sessions to finish) was sufficient history lesson for my week, though I’m guessing backstage drama on this project might have been more engaging. Writer/producer Dore Schary read his script aloud to members of the Roosevelt family toward secure of their blessing, so clearly no revisionist or scorched earth depiction of the family was intended. He tells the story in his book, Heyday, wherein Schary labors to position himself as someone other than the guy who sent Metro down disposals. 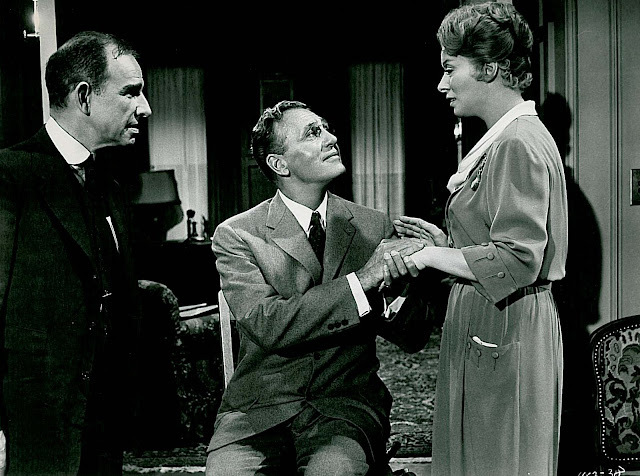 That’s about all we remember him for now, yet here for a shining season was the toast of Broadway and Tony Award winner for Best Play of 1958. 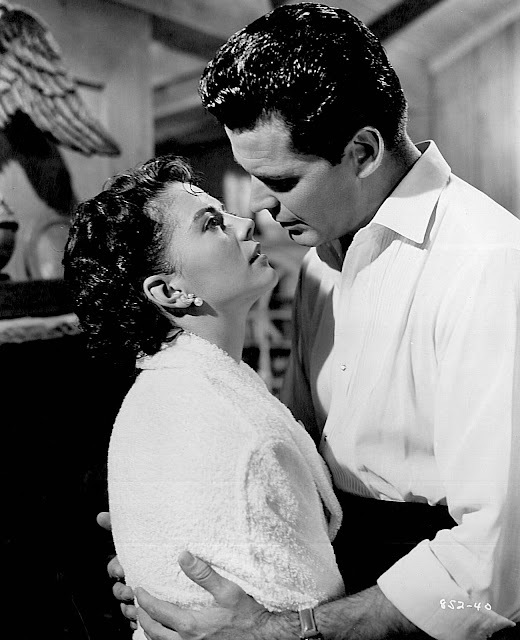 Warners handed Schary control of their movie adaptation and let his stage director, Vincent J. Donehue, perform similar set-bound duties here. It’s all dignified and cautious as to potentially thin skins among still-living characters. Bellamy plays on mannerisms that must have been irritating in the event Roosevelt paraded them about his private life as his double does here. If all great men were so affected, we can most of us be thankful never to have had to live with one. Greer Garson plays Eleanor at slow cadence with prop teeth Jerry Lewis might have donned among his Family Jewels gallery, while Roosevelt offspring are harmlessly bumptious and quick to apologize whenever childish petulance intrudes upon FDR’s meditation. Sunrise At Campobello was intended for roadshow greatness. There was a souvenir book and major drum beating after Warners sunk $2.6 million into the negative. Results were calamitous. Maybe 1960 was too late to mine Roosevelt lore, for this trip down memory lane (events happened in the twenties) realized just $943,000 in domestic rentals, with foreign showing customary indifference to Americana subjects (a piddling $135,000 there). Waves of red ink amounted to $2.4 million lost, the worst drubbing since The Spirit Of St. Louis and among WB’s all-time biggest losers. They’d need tongs nowadays to handle dialogue that’s bandied in I Was A Communist For The FBI, Warner’s salvo from quaint days when movie folk more or less agreed that Communism was bad medicine. 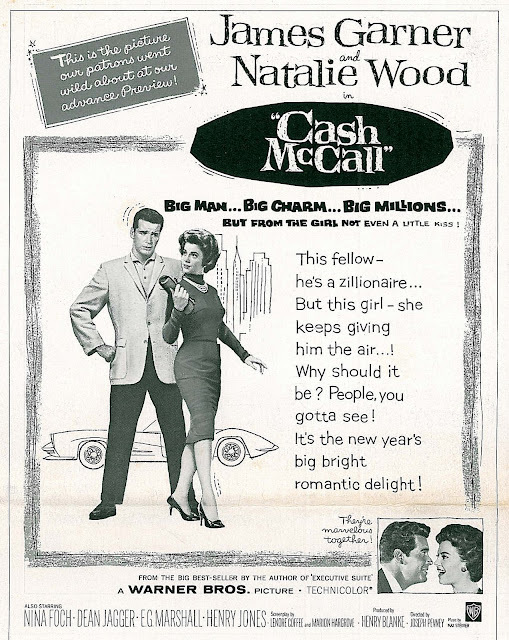 It’s really less political screed than another Big Sedan Ride, where 50’s cars lumber like elephants with interiors lit from below as though Fritz Lang built them. Characters step into automotive equivalents of the River Styx for rides to and from places foreboding and from which they may not come back. The Steve Cochrans and David Brians took wheels once Bogarts and Cagneys drove off Warner stages, and money spent lending modicum of individuality to sets and backlot streets was now withheld in a postwar environment where you could no longer tell one drab walkup from another. If life were so austere as this, why not join the Party just in hopes of variety in yours, as Frank Lovejoy apparently does here. His undercover status is revealed early, having maintained an astounding nine years being spat on and called traitor by family and friends. Did/do real-life agents sacrifice themselves so readily? A pouty son calls Frank Dirty Red as though no worse expletive could be hurled, which caused me to wonder if high-schoolers in 1951 felt so passionately over possible agitators in their midst. 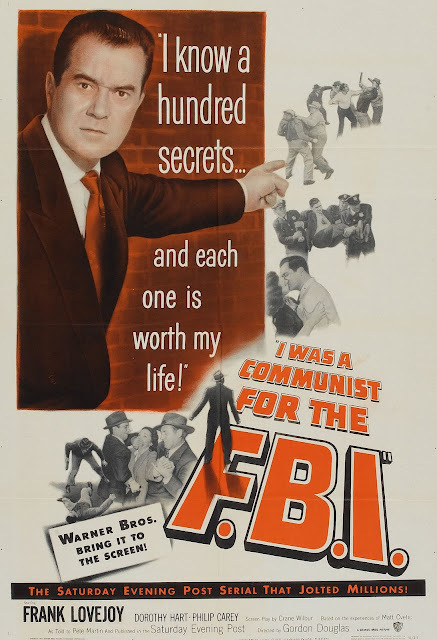 Did features like I Was A Communist For The FBI arouse a public’s vigilance or were they dismissed as simplistic melodrama? There seems no concrete reward for being a Communist operative. Lovejoy enjoys champagne and caviar at one point, but is otherwise under constant suspicion by comrades. They’re constantly tailing each other. Every two shot finishes with one or both eyeballing the other as potential turncoat against the Party. Authority is conferred, then withdrawn just prior to exiles being taken for a ride (sinister sedans again). Warner Communists are mostly gangsters minus charismatic leaders (thus avoiding Code censure for being too glamorously depicted). The idea was to present them (always) as sneaks and weasels, beneath anyone’s impulse to emulate unsportsmanlike conduct embraced by the Party. At least Little Caesar operated by some kind of honor system. It's not simply that SUNRISE has few cinematic qualities... it has so few real dramatic qualities, I'm hard-pressed to understand its success as a stage property. Such dull respect and reverence generally doesn't directly translate to a Tony-award winning smash-hit -- not now, and not even in the '50s. 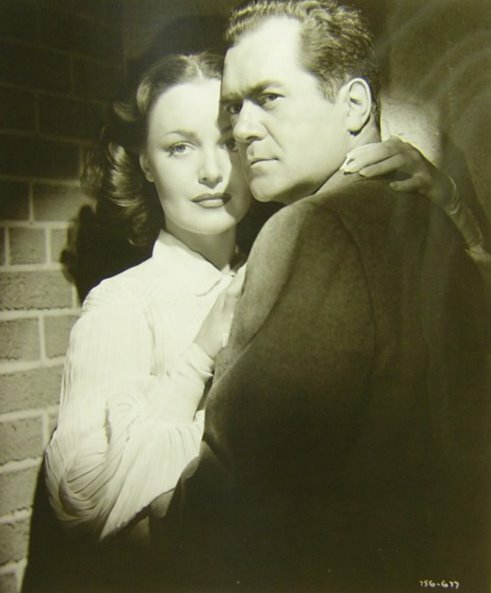 I've never seen or read Sunrise at Campobello; as a kid the subject didn't interest me, and as an adult I'd learned enough about Dore Schary to decide he was one of the smarmiest, most destructive mediocrities in motion picture history. Even so, I've always had a nagging feeling that I should at least give Campobello a look, since Schary (and everyone else) always seemed to consider it the pinnacle of his career. Well, now you and Griff have planted fatal doubts and I probably never will. Here, here, in total and complete agreement with you about Schary. Whatever you say about Mayer, he was a showman all the way -- and a competent, experienced administrator. What happened to Metro would have certainly happened anyway, sooner or later, but I believe that under Schary, the whole destructive process of the studio and it's reputation was merely accelerated. Sad to say I no longer have that letter from Stan Laurel. But imagine this man going to that kind of trouble!